May. 11, 2013 7:00 a.m.
A volunteer tends a newly planted tree at one of LEAB's community events last year. The Leduc Environmental Advisory Board is planning their annual Arbor Day Tree Planting Event this Saturday May 11th. If you have a shovel, can dig a hole, and want to help green up Leduc then you are invited! Participants are asked to bring their own shovels and meet in front of the Rona store in Leduc Common at 10am for directions about the plant. The event goes until noon when a free BBQ lunch will be offered for everyone who helped. The event will go on, rain or shine, and LEAB hopes to see 500 new young trees planted and fluttering in the breeze around Leduc this year. Arbor Day began when a settler to the Nebraska Territories by the name of J. Sterling Morton planted a bunch of trees around his new home on the open prairie as a wind break. Mr. Morton recognized the value and many uses trees have and through his job as Editor of Nebraska's first newspaper, used that format to spread the word and encourage the planting of trees. Mr. Morton submitted a resolution to the Nebraska State Board of Agriculture requesting that the government "set aside one day to plant trees, both forest and fruit." The resolution was accepted and May 10, 1872 was declared the first Arbor Day. Since that time every state in the US and every province in Canada celebrates Arbor Day. Officially usually on the Thursday of the first full week in May. 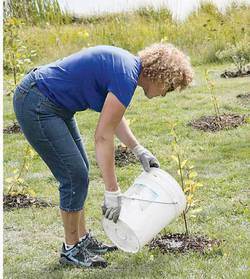 Ontario has gone one step farther by celebrating Arbor Week. So if you love all things green and have an hour or two to spare this Saturday then please come on down and join other like minded people at Deer Creek Ravine and plant a tree! ….or two, or five, or…….